Each week I participate in a live Twitter discussion, basically just geeking out about wine. Specifically Sonoma (and Napa) wines. 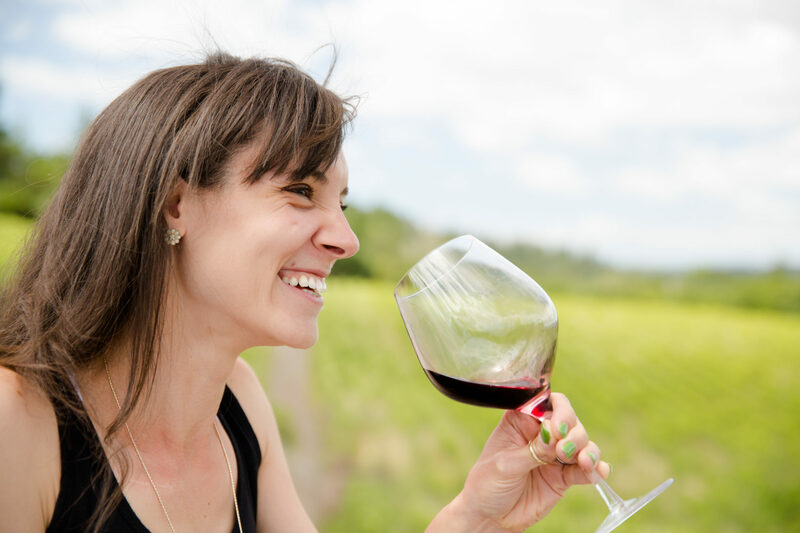 #SonomaChat is lead by the amazing Amy Lieberfarb (follow her on Twitter, Facebook, and IG to learn more), who oftentimes will share the roll of hostess/host with other bloggers, wineries, and wine pros. Last week I was lucky enough to be included as a #SonomaChat Ambassador while us wine tweeps celebrated Jordan Winery’s 40th Sonoma Birthday. As a #SonomaChat Ambassador, I was sent two bottles of Jordan Winery wines to taste as we chatted. Here is my review, along with some notes from Rob about the Jordan 2014 Chardonnay. Cheers! The wine was then aged sur lie for two months in both stainless steel and barels with båtonnage. Additional barrel aging took place in 100% new French oak for 5 and a half months. Flavor Profile: A light to medium gold in the glass, this wine just shimmers in the sunlight making you think of summer fun. But stick your nose along the lower lip of the glass, and you really do get some distinctly (or at least what I would consider) fall-like aromas — apple, pear, a bit of butter on lightly toasted bread. Swirl and place your nose along the upper lip of the glass, where secondary aromas will include a bit of honey and a soft bouquet of wildflowers. And yet, all the while, whether sniffing from the top or the bottom of your glass, there is an undeniable undertone of acid that warms your very core just by breathing it in. And that is the clue you get to the taste. The initial taste is short, but speaks of a bit of softness as distinguished in the primary aromas. But that is a brief calm before an epic storm of intensity. The acidity kicks in like a green sour apple, and your tastebuds will be salivating in no time. There’s a bit of fizziness to the texture as well — you’ll almost think bubbly, but it’s not quite there. The finish is hot, as in, your tastebuds will be standing at attention as if you’d just eaten something either super sour or super spicy. But for all of that intensity, there is a refreshing quality about the wine. The apples and pears never do leave you, and that floral arrangement — if you’re paying attention — will hang out in the back of the palate. This wine is a crazy twist and turn of the senses — but it’s fun, engaging, a wine worth trying, if anything just for the experience. From Rob: After tasting and taking my personal notes, I sat in on a FacebookLive chat with Jordan Winery’s winemaker Rob Davis and was pleased to hear that my tasting notes were exactly his intent when creating this wine. According to Rob, Jordan Winery has been slowly “fading” out the use of new oak aging and malolactic fermentation — the two things that attribute to that Cal-oaky taste and texture we know (and love) so well. Rob’s intent with this “new-style” Chardonnay is to celebrate the full expression of the grape, something oak and malo can sometimes hide. Well, I can attest to the 2014 — ain’t nowhere to hide from that Chard grape! Food Pairing: If you’re not a fan of intense acidity, definitely pair this wine with a meal that contains acidity as well to counteract that prickly tongue sensation. I would highly recommend pairing this wine with a green apple salad, tossed with an off-hard cheese (like gruyere), craisins for sweetness, and drizzled with a apple cider vinegar-based dressing. Looking for a protein? I’d go with something a little fatty like a pork loin to give the meal some weight, but also because those strong acidic flavors will do well to cut through the tender other white meat. More Info: If you haven’t yet read my #SonomaChatTwitter interview with Jordan Winery, please do so. Also, please read about our second tasting for the evening, Jordan Vineyard & Winery Cabernet Sauvignon 2012. I received this bottle as a sample for review. For more information about this wine, Jordan Winery, and to purchase wines directly, please do visit the Jordan Winery website.